Fully furnished studio apartment, in the heart of Kuala Lumpur City Centre. 7mins walk to Monorail Station (Hang Tuah), Times Square & Bukit Bintang. 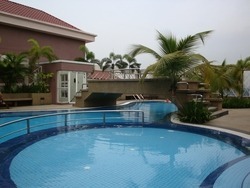 Include LCD TV, sofa, air-cond, microwave oven, washing machine, swimming pool, sauna, gym. RM1,800 (long term) or RM2,600 (short term negotiable). Please contact me Johnny Tai on 017 3389 318 to arrange appointment for viewing.